THE last I've Done It post I penned was for the month of May and while my ramblings about what I've read, eaten, seen, heard and where I've been are really a record for me, I do like receiving the odd comment to share a review of a book or thoughts on a new collection of music, or to give me tips for locales I've travelled to when I next return. But, like so many of the bloggers from back in the day - five years and counting - I have noted the dropping away of comments. I guess, like me you're just flashing through your chosen reader (Feedly's mine, if you want to know) and you've not had time to stop a while or to say something you think's of value. Rest assured, every comment is valued and rather than Tumblr, or Pinterest, or Instagram my way through cyberspace, I still enjoy blogs - especially yours. Sorry I don't comment as much as I used to, but, trust me, I am still reading your posts. I'll be back to my I've Done It posts soon and if you care to comment, now, or then, please do. I really do like it when folks drop by. In the meantime, check out my knitting. It's op shop-sourced wool and I reckon the stash will just about make a hiker's vest. If not, it'll probably be the one time I'd rather you didn't comment. The "I told you sos" are just so hard to take. Hello!! I do still read but yes, don't comment as frequently as I used to. 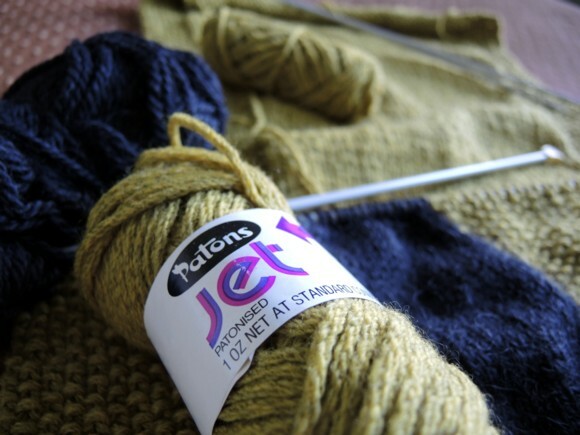 I love how the old Patons yarn is "patonised"!! You know, I never noticed the 'patonised' before. What does that mean? PS: Everyone reading the comments and replies, you just have to go visit Lien's blog, Whimsical, for a little schmoozy, cute as a button magic. Go. Now. I would never say "I told you so". Hi, I'm still here, and yes, I'm guilty of the scrolling through (I use Bloglovin) and thinking I'll comment later, when I've read everything else. But with bloglovin' unless I like a post it's very hard to get back to it again. So living in the moment and commenting now! Me too, guilty of the scroll. I bookmark stuff in my reader but it takes me ages until I come back to it. Ta for living in the moment. Bohdana, I don't know whether you've noticed, but silence is not your strong point. ;) It's my Bhutan vest - apparently cold there. And goodness, aren't we cheeky. Tell that Eduardo that he's a bad influence. Awww, thanks Steph. Yes, the knitting. I am a wee bit excited to see how this one actually wears. The wool is delicious. I have so many blogs in my reader that I rarely stop to comment unless I have a very strong opinion or something really resonates with me. Still here though, and still enjoying the read. Lindy, hello. So pleased you are. Isn't it the way though, analytics can tell you how many are reading and even where they're from geographically and what their reading habits are but it's so nice to know who they actually are. Do you feel like the move from reader has changed your blog reading also? I find I just pick through a few most recent blog posts rather than noticing when my favourite bloggers post. And the backlog has become quite horrifying. What a great blue. I've been accumulating rich reds, blue and yellows this year from various op shopping (and unfortunately shopping for new things too) adventures. Getting right into some awesome mustard + deep blue combinations!